Welcome ye all to the last post of the trip. This time tomorrow I will be home in Melbourne and the last month will be but a memory. Thanks for sharing the memory with me! Ahhhh this was a good day! We headed to Unawatuna, pretty much the next town along the coast. It’s full of backpackers, and seems to be a popular place amongst Russian tourists. It was like an island in South East Asia or something. Loads and loads of guesthouses and restaurants, all with the same fare. 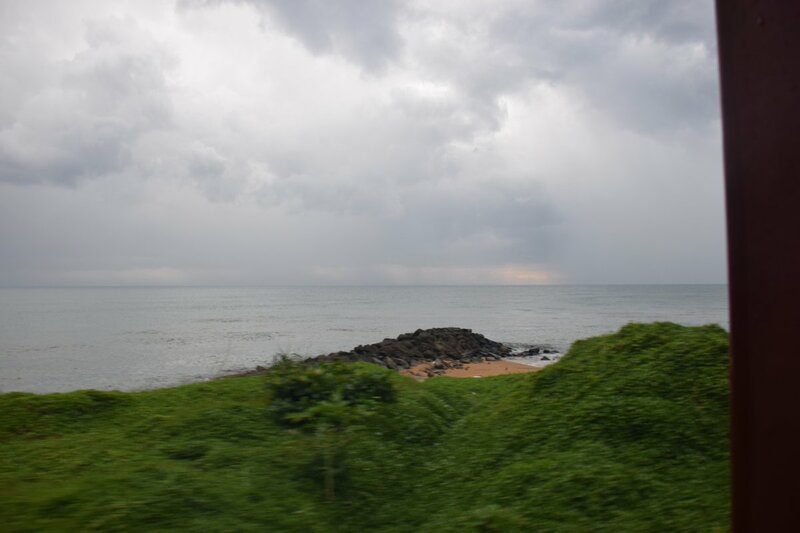 The place has been completely rebuilt after the 2004 tsunami devastated it and much of the Sri Lankan south coast. And they have built all their hotels and guesthouses, restaurants, along the shore. Apparently advice against that placement was issued but they went ahead anyways. I guess there isn’t a high chance of a recurrence, right? The waves were a bit choppy there to swim, which is what we wanted to do, so we followed a trail over a hill and came down to the ‘Jungle Beach’. It’s received mixed reviews from travellers, but the Indian Ocean is SO WARM, it’s just incredible. 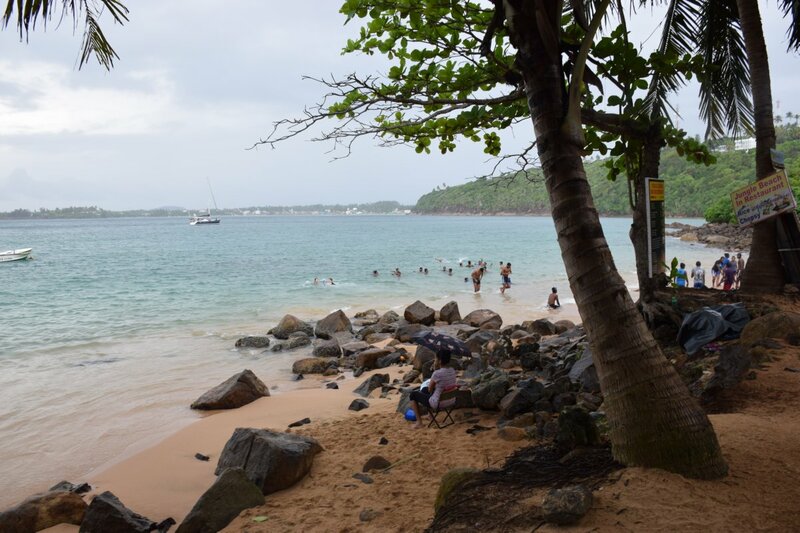 And this was a nice beach to swim in. Not far out there were plenty of fish as well. I couldn’t see them but my little action camera picked them up which was nice. I really needed some snorkelling gear! 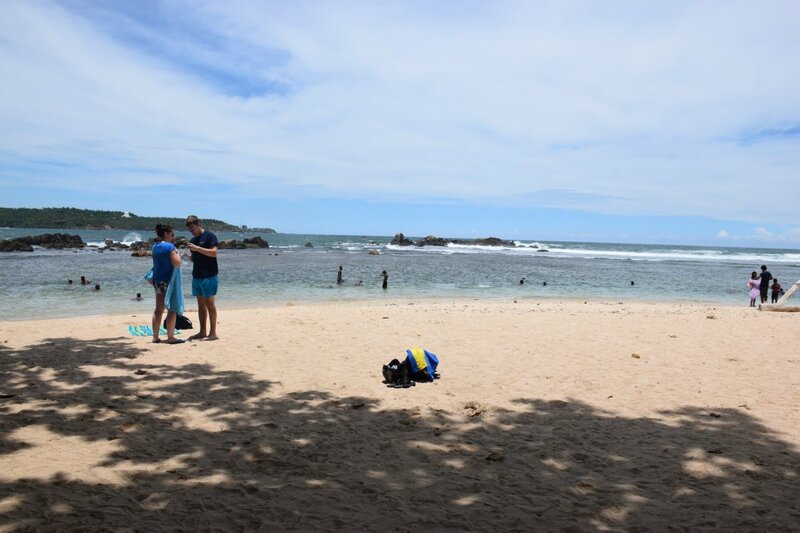 Today I tried swimming at the ‘Lighthouse Beach’, which is just below the lighthouse (strangely enough) in Galle. I didn’t enjoy the swimming so much, although the water was still very warm. The sea wasn’t deep enough and I couldn’t get deeper than just below my waist. Still, it was refreshing. We went down the coast road by bus to Habaraduwa, which has this Turtle Hatchery. 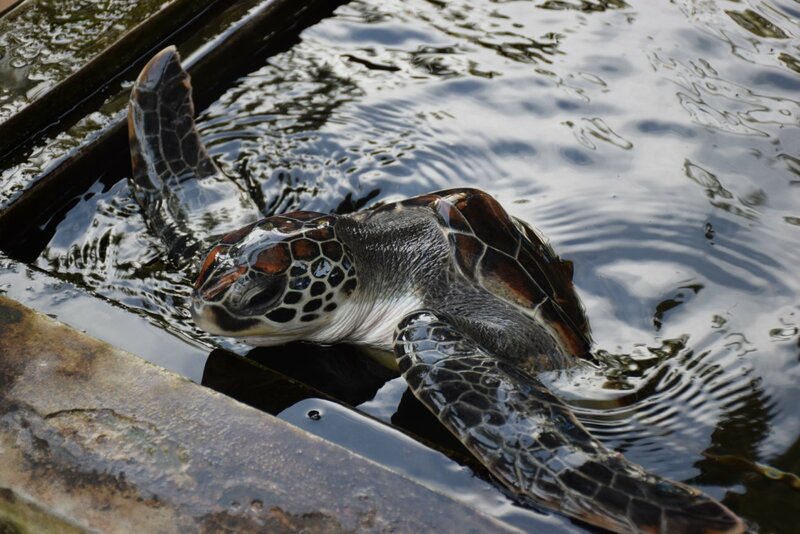 It looks after eggs and helps them hatch and also looks after injured turtles as well. It’s small and I felt sorry for te poor sea turtles being stuck in such small pools, but I guess they are getting better there so it’s the best they can manage. Then I caught a few overs (about 11) of a match at the stunning Galle Cricket Ground. A local side playing a side from the UK. The side from the UK won with 7 balls to spare, so it was pretty close, and a wonderful place to watch cricket! Last night we had a wonderful dinner out at pretty much the best place in Galle, ‘The Fort Printers’. I spent a fair bit of money, but it was our last proper night in Sri Lanka, and it was time for a splurge! And a day of waiting in some ways. Train from Galle to Colombo was at 330pm, so a bit of the day to fill. Packing, especially when it’s for the trip home, can take a while. Discovered a nice little café and spent time writing there – Pooni’s Kitchen. Then lunch and to the station. The train was more or less on time. We were at the front in the ‘observation carriage’. But then the diesel locomotive coupled on and well, we couldn’t see much out the front. But we could out the side – the track is known as the ‘Coast Line’ and it certainly hugs the coast. There were points where we couldn’t have been more than a couple of metres from the ocean! Actually, a pretty special journey. The rain came down. And down and down for the whole trip, at a couple of points it was really heavy. But somehow that just seemed to add to the experience. 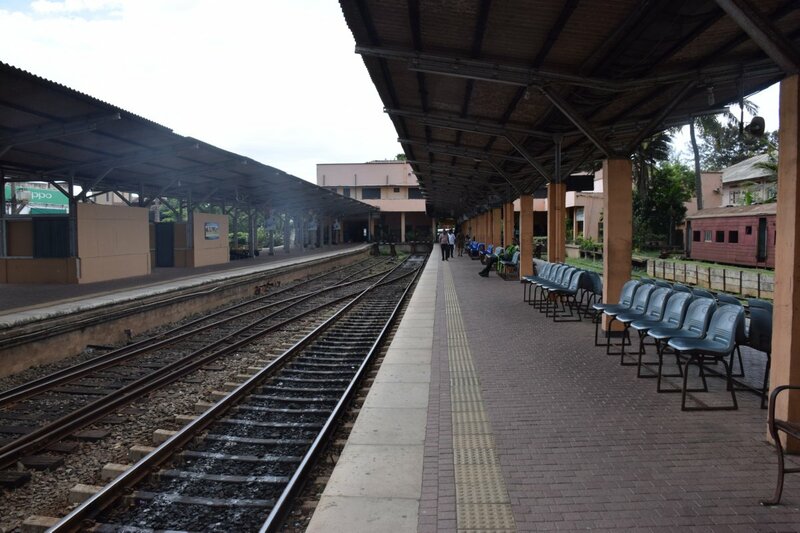 In to Colombo Fort Station at 620pm, just fifteen minutes late. Our friends picked us up, and we had a chance for final goodbyes, and then to the airport. Check in took a little longer than we would have liked, but that’s the way it goes sometimes. I’m writing from the other side of passport control looking over the masses checking in now, and I think we were lucky to be honest, there are ten times as many people there now than when we lined up. So, from Sri Lanka, and also from India, that’s me done in 2018. Thanks for following my adventures, I will certainly have lots of follow up posts and the occasional review to post once I’m home. I made need a week or two to readjust. My flight leaves in over two hours still, but it’s nice to get through early. Thanks again, and May the Journey Never End! 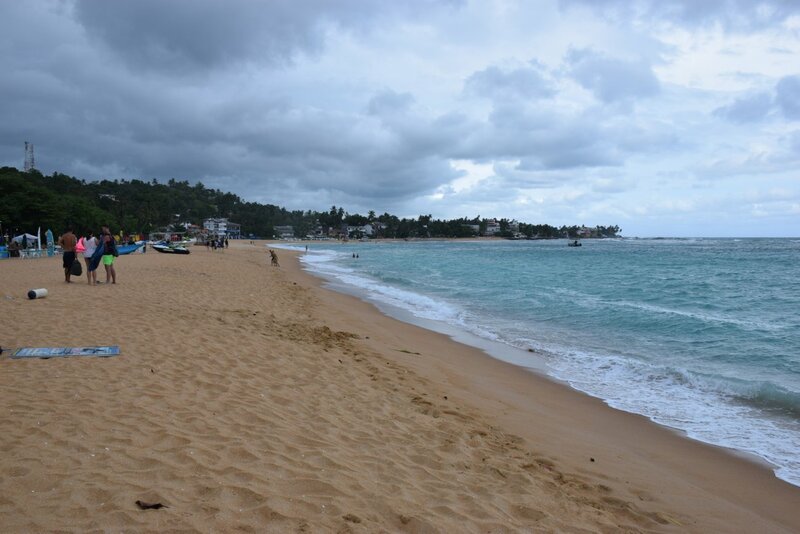 Love Unawatuna – I could have spent ages there and along that coast. Sigh. It’s got a surprising number of Russians. Cyrillic everywhere.